The UCF Board of Trustees Thursday approved a new interdisciplinary professional science master’s degree program that will expand UCF’s offerings in the rapidly growing field of nanotechnology. 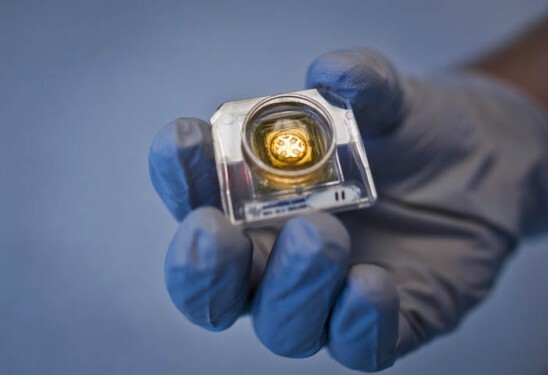 Nanoscience and nanotechnology are the study of extremely small things — detectable only with very strong microscopes — and how they can be used in a variety of fields from biology to engineering. Examples include micro cameras used in surgery, liquids used to repair scratches on cars, stain-resistant clothes and stealth technology that cloaks planes from radar. Thursday’s approval comes nearly 10 years after UCF opened the NanoScience Technology Center, which will run the new program. Students will develop the scientific knowledge necessary to make discoveries, along with the business and entrepreneurial skills they need to take those discoveries to the market. Government agencies and academic researchers have been working hard to unravel how the nano world works. It’s one of the hottest growth industries with a worldwide market estimated at $1.2 trillion by 2020, according to Global Industry Analysts. Students will work closely with industry partners, and the NanoScience Technology Center is interested in recruiting additional partners. The center’s faculty members already work with 21 companies. Interested companies can contact center director Sudipta Seal at sudipta.seal@ucf.edu. The new program is expected to begin this fall with 10 students. Approved a new bachelor’s degree in Writing and Rhetoric housed in the Department of Writing and Rhetoric, which UCF established in 2010. The program, the only one of its kind in Florida, will address employers’ needs by producing graduates who are proficient in analyzing, creating, editing and adapting text. Students will have opportunities to work with community and business partners. The program is expected to begin this fall. Participated in a demonstration of TLE TeachLivE, which improves teacher practice and student learning by giving educators the opportunity to instruct a virtual classroom full of avatar students. The experience allows teachers-in-training to perfect their skills without impacting any real students and helps veteran teachers hone their expertise or try out new techniques. Mike Hynes, a professor in UCF’s College of Education and Human Performance, created the program with education professor Lisa Dieker, College of Engineering & Computer Science professor Charles Hughes, and an interdisciplinary team that included members of the Synthetic Reality Lab at UCF’s Institute for Simulation & Training. About 40 universities around the country now use TLE TeachLivE to train future educators, and the program has been nationally recognized by both education and simulation and training associations. Thanked student body president Melissa Westbrook for her service as a trustee during the past year. Westbrook’s term as president ends in early May. She will be replaced on the board by newly elected student body president Weston Bayes. Approved changes to four student fees beginning in the fall. Following the recommendations of a committee made up of a majority of students, trustees voted to increase the activity and service fee and athletic fee each by 88 cents per credit hour, to reduce the Health fee by 5 cents per credit hour, and to increase the Capital Improvement Trust Fund fee by $2 per credit hour to help pay for Library renovations. The proposed CITF fee increase will take effect only with the approval of the Florida Board of Governors. Agreed to host the the 10th annual MEAC/SWAC Challenge Presented by Disney at Bright House Networks Stadium on Sunday, Aug. 31. UCF was asked to host the game to keep it in Orlando while the Citrus Bowl is being renovated.